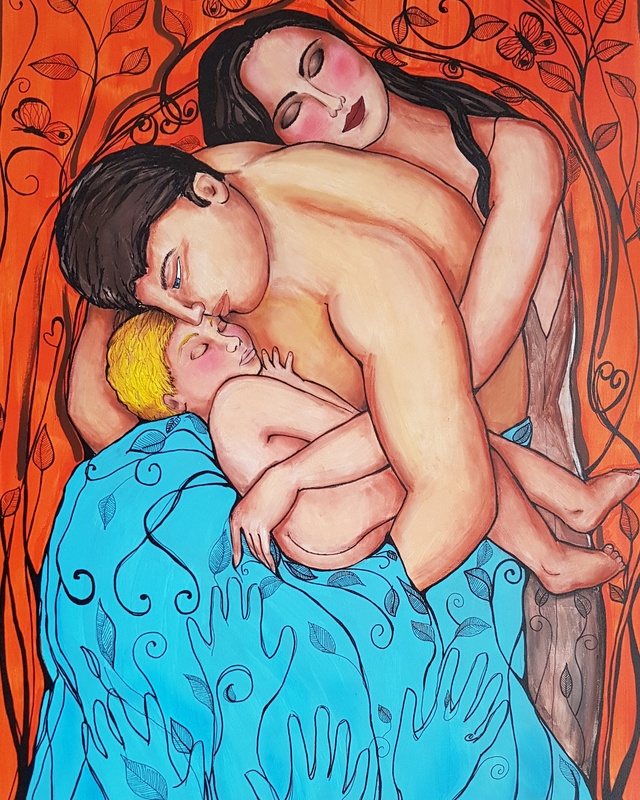 The hand paintings Family Serenity and Maternal Embrace are primarily two paintings made in a moment of great inspiration and inner serenity. Belonging to the same period in practice portray moments of warm embraces and exchanges of tenderness in an atmosphere of well-being and family peace. The hand paintings Family Serenity and Maternal Embrace are linked by narration, brushstroke and stylistic trait that then makes the author recognizable and easily places them in a single context. Together with the third painting “Child by the sea” they represent three distinct moments of the characters belonging to the same family. Although this last painting was made with smaller sizes, the trilogy closes giving it greater value and making this collection a unique work whose beauty is precisely in the representation on various angles of the same period providing close and overlapping sensations. The most recent of the three works depicts a scene of daily life where it is clear that the family love is contained in an embrace that includes all the members of the group. The work conveys a sense of serenity and well-being. The orange color in the background and the liberty elements represent the love for life. Finally the blue cloth represents the sky, the feelings and all that is mystical. 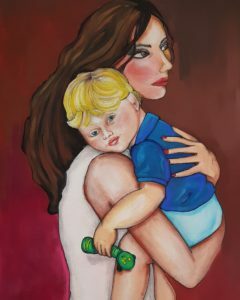 Here too, the painting depicts a moment of everyday life: the tender and protective embrace of the mother to the child. The drafting and the choice of colors is decided with full strokes. With this work, the author tells us about her sensitivity, her way of perceiving the relationship between mother and child. Child painting by the sea intent on looking for shells. The author thus feels the need to capture color and light with full brushstrokes and intense colors to represent the moment of play and the discovery of a child in the summer. This communicates his passionate and poetic way of reading life.